Dogs are one of the toughest pests to deal with because they are so darn curious! We have found bear urine to be best natural dog deterrent. Unless a dog is specifically bred to overcome this fear and hunt bear, a dog doesn't want to be anywhere near a bear! Create a "pee-rimeter" around your yard by using BearPee liquid with ScentTags, 33 Day Dispensers or ScentWraps. Use BearPee Yard Cover to deter dogs from using a specific area as their doggy restroom. Browse our selection of bear urine for sale below and find the perfect dog repellent for yards. 12 ounce bottle of 100% Pure PredatorPee® Black Bear Urine combined with a 10 pack of our weather proof 33 Day Dispensers at a great price! Hang the dispensers every 10-12 ft using the included twist ties and ground stakes. Fill with about an ounce of “pee” to create a long-lasting “pee-rimeter” that is protected from wind and rain - Big Savings when you buy multiples! 16 ounce trigger spray bottle of 100% Pure PredatorPee® Black Bear Urine combined with a 10 pack of our Scent Tags at a great price. Place the Scent Tags every 10-12 ft using the included twist ties and ground stakes. Saturate with “pee” to create a long-lasting “pee-rimeter” - Big Savings when you buy multiples! Original PredatorPee® Black Bear Urine Yard Cover Shakin' Flake Granules – 16 oz jar. Each Jar covers about 200 sq ft – Perfect for burrowing and digging pests. Great for lawns, flower beds, gardens, container gardens, etc. - Big Savings when you buy multiples! 12 ounce bottle of 100% Pure PredatorPee® Bear Urine combined with a 10 pack of our Scent Tags at a great price. Place the Scent Tags every 10-12 ft using the included twist ties and ground stakes. Saturate with “pee” to create a long-lasting “pee-rimeter” - Big Savings when you buy multiples! 16 ounce trigger spray bottle of 100% Pure PredatorPee® Black Bear Urine combined with a 10 pack of our weather proof 33 Day Dispensers at a great price! Hang the dispensers every 10-12 ft using the included twist ties and ground stakes. Fill with about an ounce of “pee” to create a long-lasting “pee-rimeter” that is protected from wind and rain - Big Savings when you buy multiples! PredatorPee® 100% Pure Black Bear Urine - 12 ounce squeeze bottle - Big Savings when you buy multiples! 100% Pure PredatorPee® Black Bear Urine - 16 ounces in an adjustable trigger spray bottle - Big Savings when you buy multiples! Includes five 64 oz growlers of Predator Pee Bear Urine equal to twenty 16 oz bottles worth, a reusable 1 gallon heavy duty sprayer, and fourteen packages of scent tags. Protects four acres or 1600 feet! Save $300 over single item prices! A 10 pack of super absorbent hanging scent wicks with twist ties and ground stakes. Attach tag to ground stake with included twist ties, place stake into the ground every 10-12 ft and saturate tags with "pee." Each 10pk will create about a 120' perimeter. Save when you buy 3 packs or more! PLEASE NOTE: THESE TAGS CONTAIN NO URINE. A ten-pack of easy-fill hanging vials to weather proof the "pee." Attach dispensing vial to ground stake with included twist ties, place stake into the ground every 10-12 ft and fill the dispensers about half way with PredatorPee to create a "pee-rimeter." Each 10pk will create about a 120' perimeter. Save when you buy 3 packs or more! PLEASE NOTE: THESE DISPENSERS CONTAIN NO URINE. 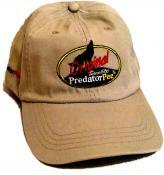 Wear the PredatorPee® Brand! The most unique hat you'll ever own - a real conversation starter - guaranteed to "Pee"que everyone's curiosity!